The revival of downtown Fresno, California’s Cultural Arts District would not be complete without the Iron Bird Lofts, a new mixed-use project that adds artistic flair to the area’s aesthetics. A beautiful wall mural, contemporary sculptures and a steel vine with bird fixtures complete the stylish and artsy exterior, while private studios and ground-floor storefronts entice budding artists and small-business owners. 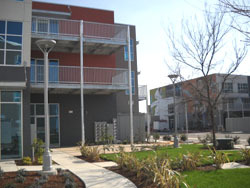 The Iron Bird Lofts’ central location provides residents with the advantages of downtown Fresno, including public transportation, major highways, the Community Regional Medical Center, Chukchansi Park, entertainment venues, the Fulton Mall and other businesses and retail shopping. In addition to the city’s numerous amenities, city dwellers from all parts of Fresno flock to the Iron Bird Lofts to grab a sandwich and coffee from the café, where they can attend poetry jams, open-mic nights and other entertainment. Residents also socialize with neighbors in the building’s lounge, courtyard and plaza. The Iron Bird Lofts consist of 48 two-story lofts, 16 two-bedroom flats, and 16 three-story townhouses that include studios designed for residents to run businesses on the first floor. In addition to private studios, townhouses provide the luxury of a reading corner and attached garages. Lofts are designed with open floor plans with vaulted ceilings, floor-to-ceiling windows for natural light, walk-in closets, and other spacious living features. Third-floor windows and balconies offer beautiful views of the Cultural Arts District. Granville Homes open floor plan design in Iron Bird Lofts utilizes Keene Building Product’s Quiet Qurl™ 60/040 MC HP sound control mat in the construction of these residences, preventing sound from traveling between Iron Bird Lofts’ residences, businesses, and private studios. Quiet Qurl™ 60/040 MC HP is a polymer matrix with a non-woven fabric that creates space in the ceiling assembly; this prevents the transfer of noise through touching assembly components. The extra thickness of Quiet Qurl™ 60/040 MC HP, verses thinner Quiet Qurl™ products, adds very little to the overall assembly thickness, while out-performing rubber mats twice its size. The product also allows the builder to use a thinner concrete pour in the floor underlayment. It is a “high-end” solution that allows greater flexibility in surface choices, and produces greater vibration noise control. The Iron Bird Lofts prides itself on its accommodations for artists and professionals who can conduct business in their own homes. Sound isolation is an absolute necessity to allow developing businesses and young artists to flourish amongst open-ceiling studios and loft layouts. The Iron Bird Lofts’ storefronts, café entertainment and surrounding city life give the area much of its appeal and excitement; however, they also provide even more reason to prioritize noise Control. Keene’s Quiet Qurl™ 60/040 MC HP plays a key role in keeping Iron Bird Lofts’ home and business environments peaceful and productive.